As a Hollywood connection shows, the recently deceased Soviet hockey coach’s record of success inspired fear in his foes. Lucas Aykroyd talks to Zinaid Memisevic, who played the role of Tikhonov in the 2004 movie Miracle, and reflects on the legendary coach’s contribution to hockey. When the great Russian hockey coach Viktor Tikhonov died at age 84 in Moscow on Nov. 24, it created a ripple wave of diverse tributes – right around the world. More than 5,000 miles away in Vancouver, Canada, Zinaid Memisevic sits in a downtown hotel lobby and reflects on Tikhonov’s legacy. Silver-haired with thick eyebrows, the 64-year-old Sarajevo-born character actor gave Hollywood’s best-known portrayal of Tikhonov in the 2004 movie Miracle. Filmed in Vancouver, Miracle stars Kurt Russell as the American coach Herb Brooks, and tells how a group of U.S. college players edged Tikhonov’s elite Soviet squad 4-3 in the “Miracle on Ice” game at the 1980 Winter Olympics in Lake Placid, New York. The irony, of course, is that without Tikhonov’s incredible record of success, that result would never have been called a “miracle.” It was a rare misstep in a career forged from gold. What exactly made Tikhonov a legend? Put simply, he knew how to win, and his reputation transcended hockey. He was a household name among sports fans worldwide. Memisevic grew up in Yugoslavia, played semi-professional soccer, and watches more English Premier League action on TV than hockey today. Yet the actor vividly recalls the 1984 Winter Games in his native Sarajevo, where Tikhonov led the Soviet team to the gold medal. It was the first of three consecutive Olympic triumphs under his command. 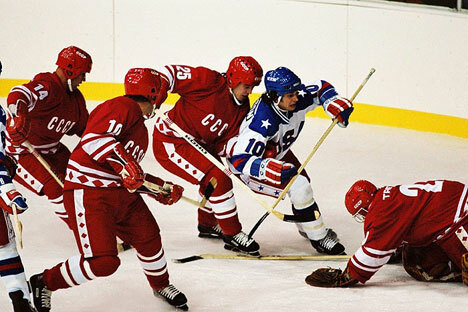 In Sarajevo, the Soviets outscored their opposition 48-5. That was typical for Tikhonov, whose greatest strength as a coach was his insistence on maximum preparation – both on and off the ice. When his “Big Red Machine” was firing on all cylinders, it was virtually impossible to stop. Tikhonov came up through the Soviet system with no easy shortcuts. He worked as a bus mechanic as a young man. Between 1949 and 1963, he played 296 games on defense in the Soviet League, and won four championships with VVS (the Soviet Air Force team) and Dynamo Moscow. After his playing days ended, success as an assistant coach with Dynamo Moscow and as the head coach of Dynamo Riga prepared him to take over both CSKA Moscow and the national team in 1977. There, Tikhonov exercised unprecedented control over the schedule, conditioning routines, and the personal lives of his players. They trained 11 months each year, while he obsessively studied hockey tactics. He was ahead of his time, from his emphasis on dry land workouts to his consistent use of four forward lines rather than three during games. All told, Tikhonov’s results included eight International Ice Hockey Federation (IIHF) World Championships, victories over NHL pros at the 1979 Challenge Cup and 1981 Canada Cup, and 12 straight Soviet League titles – in addition to his Olympic glories. Memisevic took a more low-profile path en route to portraying Tikhonov in Miracle. He studied acting in Belgrade, spending 22 seasons with the National Theater, and moved to Canada’s West Coast in 1994 to build his career. In October 2002, he auditioned for Miracle, originally seeking the part of American team doctor George Nagobads. Four months later, his agent called and told him director Gavin O’Connor wanted him to play Tikhonov instead. Memisevic was honored. “Some Russian actors who lived in Vancouver told me, ‘I would be happy to play that part for free!’” he recalls. He appeared in two scenes, the 10-3 Soviet pre-Olympic win over the Americans at New York’s Madison Square Garden, and the “Miracle on Ice” game on February 22, 1980. The PNE Agrodome, located next to the Pacific Coliseum where Pavel Bure once starred for the Vancouver Canucks, was used to depict the Lake Placid hockey arena. Memisevic fondly recalls how a sequence featuring nods of mutual respect between Tikhonov and Herb Brooks from their respective benches took close to 10 takes for him and Kurt Russell to nail. “Tikhonov was the greatest of the greatest,” says the actor, who nowadays helps his wife of 43 years operate a child-care business. Tikhonov once said of his most famous 1980’s centerman: “I am an atheist, but I am ready to acknowledge that Igor Larionov is a divine playmaker.” As a consummate taskmaster, Tikhonov was not always respected or loved by stars like Larionov or Vyacheslav Fetisov, who fought to break free from his rule in the twilight of the Soviet Union. Yet love him or hate him, there’s no denying that Russian hockey achieved a high-water mark under Viktor Vasilyevich Tikhonov. He was inducted into the IIHF Hall of Fame in 1998. Miracle can be ordered on DVD on Amazon’s U.S., Canadian, and British web sites. It can also be viewed on Netflix.